A rare male model posed for us today, all buttoned up and dignified under an oversized fur hat (I would have guessed fox, or maybe coyote). I imagined him as a Russian come in from the cold, or maybe a Maine trapper, wondering where he left his snowshoes. 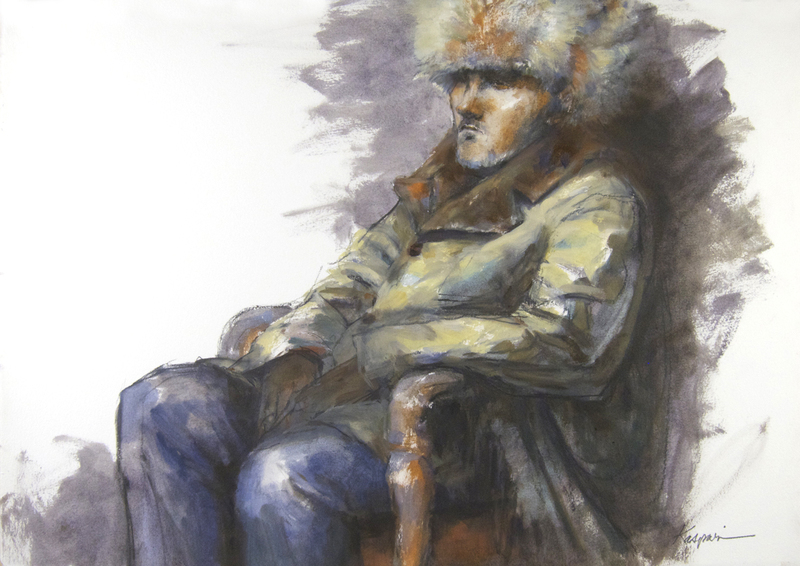 Man in Fur Hat, oil on Arches oil-primed paper, 22″ x 15″. 2 hour pose. As usual, I loved your post. As a bioligst with some experience with south and central ameria I’ll always miss art from those gounds. You and I have actually cross a some grouns in Panama and somewhat aroud Manaus. But I’ll never tire of anything you blog. I’m a pre-kindergarten practionist of art but am actually a somewhat adult to greatly appreciate and learn from anythin you awfer. Thank you. Keep it up. Amazing depth in the image!